In the School for Change Agents, our working definition of “resilience” is the ability of an individual to adjust to adversity, maintain equilibrium, retain some sense of control over their environment and continue to move on in a positive way. We teach that resilience acts “like a muscle”. It’s something we grow, and something we can strengthen over time through experience. I thought working in the NHS would give me a feeling of mission and purpose. Now I’m here, I feel so lonely. It’s like nobody understands what I’m trying to do. Or nobody cares. How do I keep going when everyone seems to be knocking me down? All three statements share a sense of being overwhelmed. 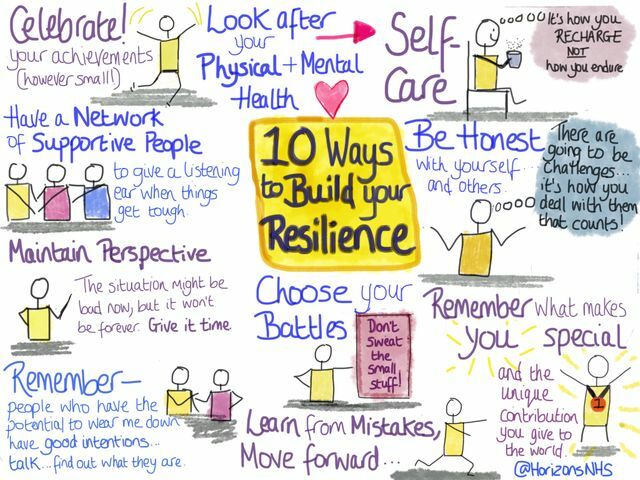 Even the idea of ‘building my resilience’ can feel large and too abstract to action. Yet, like physical exercise, the key may be taking small steps – little and often. Re-frame your fears and challenge by contemplating it head-on. Change one small thing in your weekly routine. Be open to where it may take you – if you give it time. But I especially love it as an example of people sharing a challenge and – through the process of supporting each other – finding a collective resilience that they could not have achieved alone. It’s a classic example of the power of moving from ‘me’ to ‘we’ – which is the central theme of our next School module. Learn more about why you need a “Spectrum of Allies” from my colleague Leigh Kendall. If you suffer from anxiety the last thing you probably want to do is perform on stage. Even more scary would be to perform on stage without a script. But the people behind this class in Canada think improv might be just what you need.